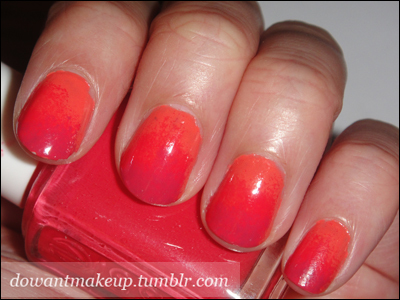 I tried a gradient nail look with Revlon Mad About Mango, Essie Flirt, and Rimmel English Rose. The result is waaaay brighter than I expected but I kind of like it and it reminded me of a sunset. I think I picked shades that were too close to each other, because the gradient effect is really subtle unless under bright light. Even under flash it’s hard to see Flirt (mid-nail) and English Rose (tip) as two separate colours.